Despite significant rains in March and February, North Coast winegrape growers are honing their skills in using less water as the threat of spring frost, summer heat and long-term drought loom in their minds. 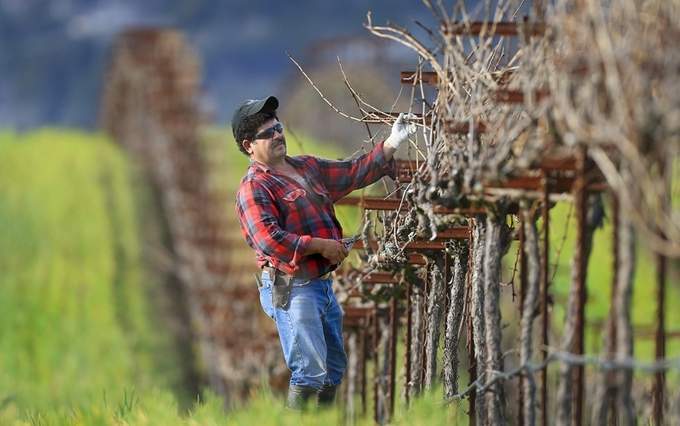 “I don’t think anyone had any illusions that we would get so much it filled our shortage problems,” said Duff Bevill, whose Healdsburg-based Bevill Vineyard Management farms 1,000 acres in Sonoma County’s Alexander, Dry Creek and Russian River valleys. The grower community that is hardest hit are those who get their water from the main stem of the Russian River from lower Mendocino County into Sonoma County, Mr. Bevill said. As of Wednesday, Lake Sonoma was at nearly 76 percent capacity, and Lake Mendocino, 52 percent, according to Sonoma County Water Agency. Lake Pillsbury, which feeds the Eel River, was almost 94 percent full. Atlas manages 40 acres in Anderson Valley, and stored water there is worryingly low for frost-protection purposes, he said. Yet recent rains have brought the soil profile — how much water is stored there for vine roots to tap — back to maximum in many areas of the region, he said. 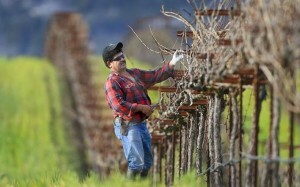 Budbreak came two to three weeks earlier than usual on the floor of Mendocino County’s Anderson Valley, led by chardonnay vines, according to Randy Schock, co-winemaker of Handley Cellars. Shoot buds just emerged for pinot noir in ridgetop vineyards. Though Handley hasn’t yet faced frost or near misses, the vintner is preparing to use stored water only for the most developed vines. Frequent operation of wind machines to fight frost can be disturbing to neighboring residents, so Handley is spraying Frost Guard plant-based organic polymer to limit water emitted from vine leafs. “We will all cross our fingers and hope it is not a bad frost season,” he said. Recent rains have softened the soil to the point that getting crews into the vine rows is difficult, Mr. Schock said. So vine growth has progressed far ahead of planned, he said. A number of growers in ultrapremium regions have been practicing forms of “deficit irrigation,” or watering vines with a fraction of what they need to push them to concentrate on grape berry development rather than foliage. Yet phones are ringing more often these days for vineyard consultants with expertise in further water management. One of the tensions between growers and winemakers for more than a decade has been that vintners may not find desired flavor, color and other aspects of grape ripeness until sugar levels in the berries reach higher levels. During cool seasons, reaching those levels pushed harvest of red varieties dangerously close to fall rains — and sometimes after them. Talk about drought may shift the conversation toward harvesting at lower sugar levels, Dr. Greenspan said. Growers are getting a larger selection of devices that help them figure out how much water vines are using and better make decisions on when and how much to water. A new tool developed at University of California, Davis, is rolling out to North Coast vineyards this spring from Oakland-based Tule Technologies. For $1,500 a year per site, the 2-year-old company installs a surface-renewal sensor station, maintains it and delivers to growers weekly reports — and daily via an Internet site — on how much water the area of the vineyard around the station consumed, how that compares with the current standard, “reference evapotranspiration,” and the water-cycle forecast for the coming week. Read the full story via North Coast growers adjust to drought despite rains – North Bay Business Journal – North San Francisco Bay Area, Sonoma, Marin, Napa counties – Archive.